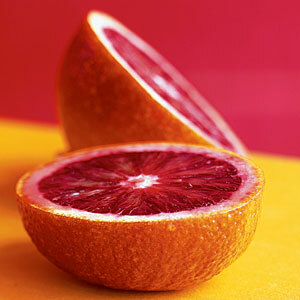 Blood Orange essential oil has a warm, fresh citrus scent, radiant, fruity and tangy with a hint of raspberry. Citrus sinensis is a middle-sized evergreen tree, covered with bark of a greenish-brown color, having auxiliary spines on the branches. The leaves are alternate, ovate-oblong, acute, shining green, the stalk more or less winged. The blood orange has streaks of red in the fruit, and when squeezed the juice is often reddish. The uplifting and stimulating scent of Blood Orange Essential Oil is considered by aromatherapists to have anti-depressant and aphrodisiac properties. Its chemical constituents are antiseptic and anti-spasmodic as well. Their red pigment, anthocyanin, is an antioxidant that is rare in the rest of the citrus family. A recently hybridized orange, it was cultivated in China and the southern Mediterranean in the early 18th century. The three which are widely cultivated today are the Moro, Toracco, and Sanguinello. Avoid exposure to sunlight after skin application due to possible photo-toxicity.